After only a week, 'Fortnite' is already king on iOS. Epic Games’ Fortnite has seemingly beaten PUBG already to become the most popular Battle Royale game, and since releasing on Apple mobile devices last week, the game quickly demolished its mobile competition in terms of earnings, even Candy Crush and Pokémon GO. But Fortnite is totally free-to-play, and the only things you can spend money on are cosmetic items or the Battle Pass that allows you to complete in various challenges. Even Battle Pass rewards are cosmetic, meaning that they in no way positively impact your gameplay beyond making you look like John Wick or transform your parachute into a spaceship. Or, you know, some groovy dance emotes. 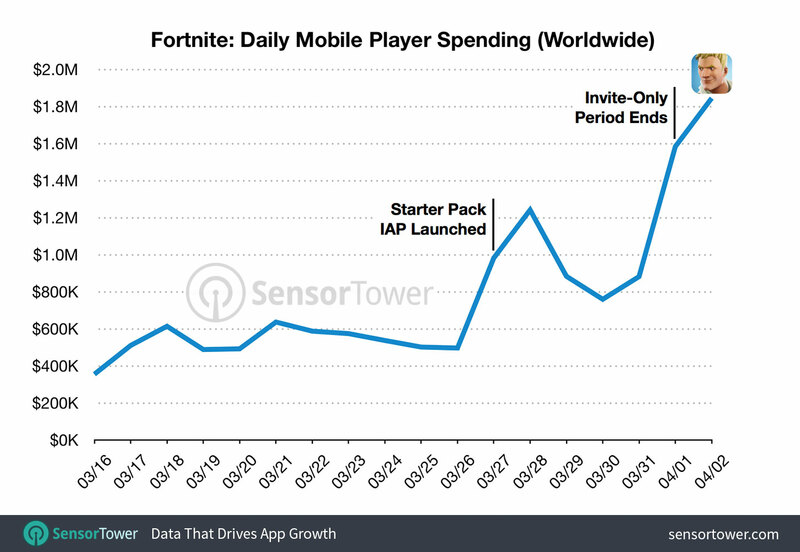 On Friday, Sensor Tower — a website devoted to app data — released several charts and bundles of statistics showing the growing success of Fortnite on mobile, and the results are nothing short of staggering. Fortnite makes almost $2 million a day, and that’s only on mobile. Fortnite was announced for iOS in mid-March as an invite-only download, and Epic Games didn’t didn’t fully monetize the experience until later in the month. But earnings really spiked after Fortnite on iOS became a free download for anyone at the end of March. 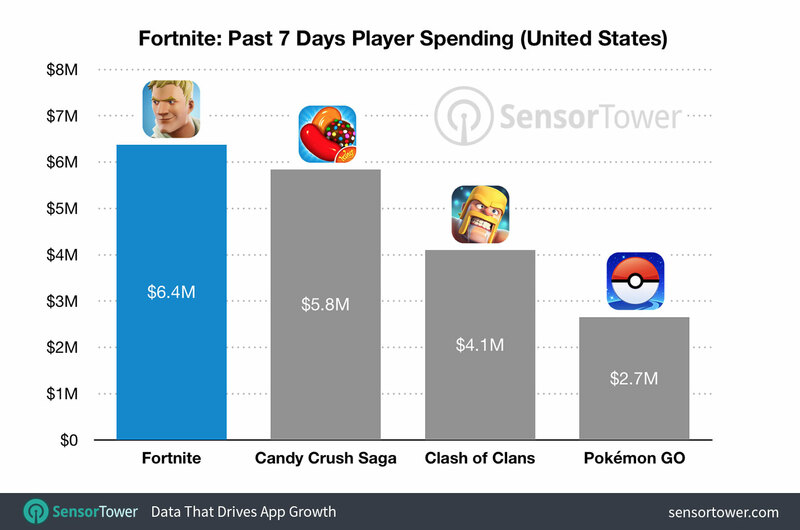 Between March 30 and April 6, Fortnite players spent almost three times the money spent by Pokémon GO players in-game — and also way more than Clash of Clans and Pokémon GO earnings combined. This is just the first week! Interestingly enough, the in-game purchases in most mobile games have great in-game value, and they sort of manipulate you into making these purchases. Candy Crush Saga encourages you to buy extra lives, and in Pokémon GO, you can buy all sorts of useful in-game items like Poké Balls or Lure Modules to help you catch more Pokémon. Make like a worm... and wiggle! It’s a brilliant move for Epic Games to avoid directly monetizing the Fortnite: Battle Royale game experience like other mobile games, which can oftentimes make the player feel cheated or manipulated out of their money. Remember the disastrous outcry from Star Wars: Battlefront II’s initial “pay to win” model of in-game purchases, which was egregious for such a high-profile console game and even used lottery-style loot boxes. But in Fortnite, you always know exactly what you’re paying for, such as when you purchase the creepy Raven skin. Fortnite thrives with a casual — albeit intense — gaming experience. The straightforward Battle Royale game experience and simple graphic style of Fortnite make it ideally suited to a mobile version. The fact that Fortnite also supports cross-platform play means that anyone who plays the game on iOS can use the same gear and items from their PlayStation 4, because the same Epic Games account gets used across all platforms. This additional and somewhat uncommon benefit makes it that much easier for players to give in and drop the $10 or so it costs for a Battle Pass, allowing players to do Weekly Challenges on whatever platform they want. Fortnite with its famous “Battle Royale” game mode is now available on PC, PlayStation 4, Xbox One, and iOS with an Android version due out in a few months.